Why do my feet cramp during Pilates? 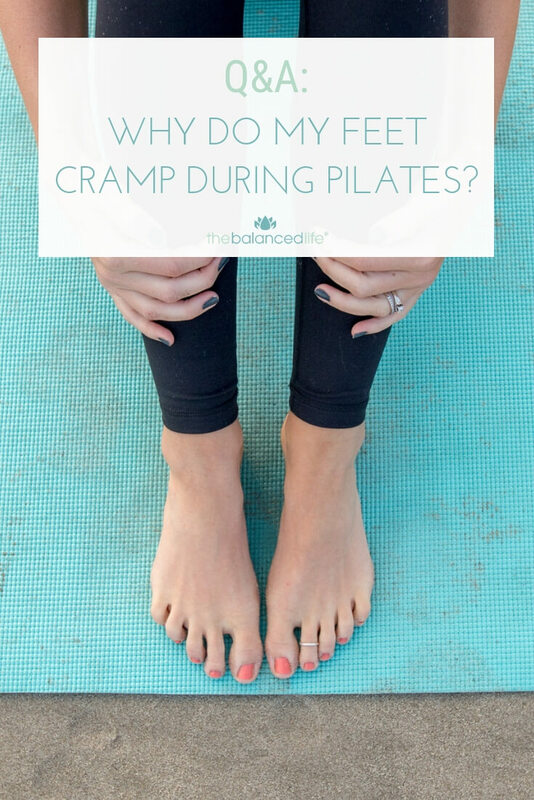 I wanted to answer a question I receive quite often and hope that it helps those of you who struggle with your feet cramping during Pilates and other exercises. Foot cramps are fairly common when starting a regular Pilates practice, but they can be quite annoying and disruptive when you’re trying to keep up with the movements in a workout. The truth is, there isn’t much conclusive research as to why feet cramp. However, there are a few things that I’ve found to help prevent and relieve foot cramps during Pilates. 1. Warm up your feet: not with socks, but with movement. 🙂 Prior to starting a workout spend some time pointing and flexing your feet/ankles. If possible, massage the underside of your foot with a tennis ball. This YouTube video would also be a great way to warm up. 2. Relax your feet: It’s okay to relax your feet. Excessive pointing or curling your toes can lead to cramping. Try lengthening your toes, relaxing your feet, or even flexing your feet if needed. 3. Drink plenty of water: Slight dehydration can disrupt your electrolyte balance, which can lead to cramps. 4. Increase potassium intake: Adding potassium-rich foods to your diet (such as: white beans, potatoes, sweet potatoes, beets, spinach, oranges, and bananas) can help to prevent cramping during your next workout. I hope this helps! Have any other questions? Let me know in the comments below! PS – Do your hip flexors sometimes hurt during Pilates? Check out this blog post for my answer to this very common question. Stepping outside of your comfort zone + being your true self: A Q&A with Renee HahnelBlack Friday Sale + a fun quiz! Loved reading your article, Robin! Thanks for addressing a problem that most beginners face. This workout technique emphasizes body balance and helps you develop core strength. I would like to add that it is necessary to warm up your muscles before starting your Pilates workout, since cold muscles are more prone to injury.